The United States Mint unveiled prices and household order limits for its suite of upcoming products that celebrate the 50th anniversary of the Apollo 11 Moon landing. The limits range from 1 to 100 and published prices are from $25.95 to $224.95. On Jan. 24, the U.S. Mint will release curved-shape Apollo 11 50th Anniversary Commemorative Coins composed from gold, silver or clad and struck in collector qualities of proof and uncirculated. (See images of the coins.) 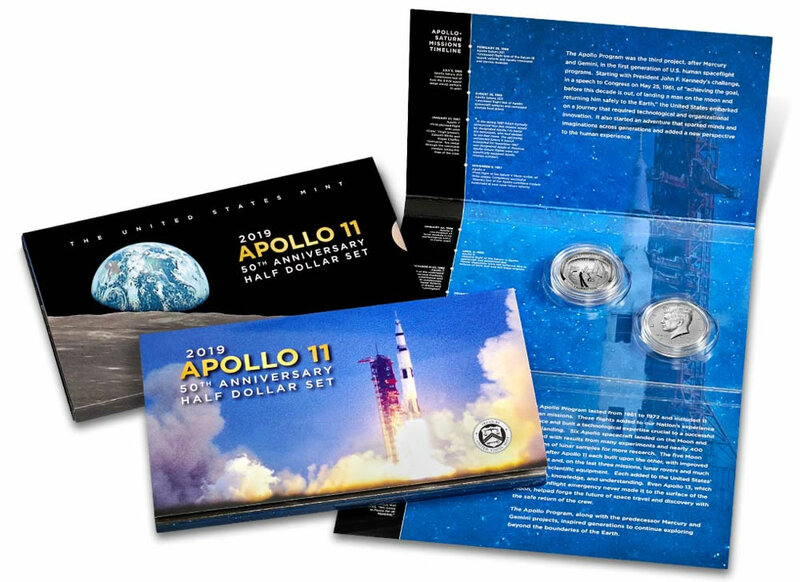 The Mint will also issue a set containing a proof Apollo 11 half-dollar and an enhanced reverse proof Kennedy half-dollar that commemorates the relationship between President Kennedy and the American space program. *Prices for the gold coins will be available the day before their release and based on the trending value of gold. Based on gold’s current price of about $1,290 an ounce, today the proof $5 gold would be $418.75 and the uncirculated $5 gold coin would be $408.75. Prices include surcharges of $50 per 5-ounce silver dollar, $35 per gold coin, $10 per silver dollar, and $5 per half-dollar. Provided the coins turn a profit, the collected funds will be shared between the Smithsonian Institution’s National Air and Space Museum’s Destination Moon exhibition; the Astronauts Memorial Foundation; and the Astronaut Scholarship Foundation. As discussed last week, the U.S. Mint and the Royal Australian Mint are collaborating on a special set featuring a U.S. Apollo 11 half dollar paired with an Australian Moon Landing 1 oz. $5 Silver Coin. Its price, release date, and limits are not yet available. I predict the gold will be an instant sell out, but I can’t believe the outrageous price on the 5oz puc! Now that’s REALLY highway robbery! I’ll buy the gold, but I’m having second thoughts on the 5oz…. i just got back from the f.u.n. show, i thought the u.s. mint would have these on display but they did not. often they will have soon to be released products on display. i agree with j. peter on the gold being a quick sell out. by the way the f.u.n. show was fantastic as usual. There are a Black Horse : Enhanced reverse proof Kennedy coin . It is only 100k set mintage . But 1 thing keep on mind : it didn’t contain any silver ! So, that mean 50 cent is value 50cents . 2nd thing : half dollar proof coin charge almost $28 each . Is it made by Tiffany Company ? What the Heck . No wonder why Numismatics is down trend . That’s funny, Richard, but not really. Mike “Sold Out, Limited Edition” Mezak I am sure will be hawking them this weekend. “Provided they turn a profit” REALLY?? The “surcharge is put in place to help these places and should be a separate fund!! NOT “provided” they turn a profit… But at these prices they should turn a hefty profit! Another joke from the us mint that nobody wants, who designs this garbage. Maybe the same ones that came out with the ww1 medal zombie junk.!! $225.00 for a five ounce silver proof coin is absolutely ridiculous! What a rip off for 5 oz of silver. I certainly won’t buy one at that price! How is that price justified? I would like to thank Mike for his continuous feed of information to us coin collectors. The gold & the Kennedy sets will be successful issues for the mint and good coins for collectors. Whatever anyone’s opinions about these coins, they are going to sell. The 5 OZ was “ON BACK ORDER”.within 5 minutes of the opening release time. Was there a pre-order option? Or was that their plan, to back order the initial run of 100K? Right? I was sitting there ordering as soon as it hit and it took me 17 minutes just to get my order in my cart the site was so slow then when ordering the 5 oz. it said back order on my purchase. WTF? if australia mint already minted them why is there a back order? Mint shipped my whole order except the 5oz. someone on ebay is selling one in hand for $325 after getting one from some ceremonial day of release?